The government of Kenya signed a loan agreement with the Japan International Cooperation Agency (JICA) for a loan of Sh35 bln (approx. USD 340 mln) for construction of Phase II of the second container terminal at the port of Mombasa, informs Construction Business Review. According to the Kenya Ports Authority managing director Catherine Mturi-Wairi, the signing of the deal will enable the contractor to start working on site by January next year. “We already have the Sh35 billion financing from the Japanese government. We are now in the tendering process but construction must commence by January 2018,” Ms Mturi said in an interview last week. The largest port in East Africa and a hub for cargo distribution in Kenya and greater East Africa, Mombasa Port has seen its volumes growing rapidly in recent years. The 1.1 mln TEU capacity of the Mombasa Container Terminal was not enough to accommodate the increasing cargo flows, and in February 2016 Phase I of a new facility – Kipevu Container Terminal – was completed, again with the support from JICA, adding 550 000 TEU to Mombasa port’s container capacity. Phase II is expected to provide additional 450 000 TEU. The new Kipevu Container Terminal is located at Kilindini Harbour on an area of 100 hectares at the western side of the existing Kipevu Oil Terminal. Upon completion of the whole project (Phase I, II and III), the facility will have a capacity of 1.2 mln TEU, 3 berths with quay lengths of 230m, 320m and 350m and drafts ranging from 11m to 15m to accommodate Panamax and Post Panamax container ships. The construction is to be completed in 2023. 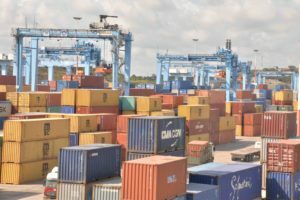 The new terminal is expected to ease congestion at the Mombasa port, making the facility more competitive amid growing competition from the port of Dar es Salaam in neighbouring Tanzania. The project started in 2012 and is financed by a loan from the Japanese government through JICA within the Special Terms for Economic Partnership (STEP) at an interest rate of 0.2% and a repayment period of 40 years including a 10-year grace period. One of the conditions for funding of the terminal by the Japanese government was that it would be operated privately. The bidders at the tender to run the new terminal reportedly included Hutchison Ports Investments, DP World, PSA International, China Merchants Holdings and SSA Port Terminal. However, following the scandalous publications in the local press stating that some bidders were colluding with senior Port Authority officials, the Kenya Ports Authority cancelled the tender and presently operates the terminal itself. There is no definite information when the tender process will be resumed.